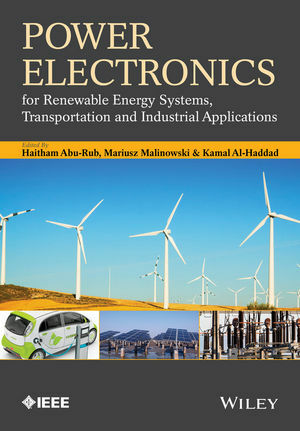 With emphasis on the importance and long-term viability of Power Electronics for Renewable Energy this book brings together the state of the art knowledge and cutting-edge techniques in various stages of research. The topics included are not currently available for practicing professionals and aim to enable the reader to directly apply the knowledge gained to their designs. The book addresses the practical issues of current and future electric and plug-in hybrid electric vehicles (PHEVs), and focuses primarily on power electronics and motor drives based solutions for electric vehicle (EV) technologies. Propulsion system requirements and motor sizing for EVs is discussed, along with practical system sizing examples. Key EV battery technologies are explained as well as corresponding battery management issues. PHEV power system architectures and advanced power electronics intensive charging infrastructures for EVs and PHEVs are detailed. EV/PHEV interface with renewable energy is described, with practical examples. This book explores new topics for further research needed world-wide, and defines existing challenges, concerns, and selected problems that comply with international trends, standards, and programs for electric power conversion, distribution, and sustainable energy development. It will lead to the advancement of the current state-of-the art applications of power electronics for renewable energy, transportation, and industrial applications and will help add experience in the various industries and academia about the energy conversion technology and distributed energy sources. Haitham Abu-Rub is currently a professor at Texas A&M University at Qatar. His main research interests are energy conversion systems, including renewable and electromechanical systems. He has published more than 200 journal and conference papers, coauthored four books, supervised several lucrative research projects, and is also an editor of several international journals such as in the IEEE Transactions on Sustainable Energy. He is currently leading various potential projects on photovoltaic and hybrid renewable power generation systems with different types of converters. Mariusz Malinowski is currently with the Institute of Control and Industrial Electronics (ICIE) at Warsaw University of Technology (WUT). He has authored more than 100 technical papers and is the holder of two implemented patents. Dr. Malinowski is also an Associate Editor for the IEEE Transactions on Industrial Electronics, IEEE Transactions on Power Electronics, and previously edited the IEEE Industrial Electronics Magazine. He was the recipient of the Siemens Prize (2002, 2007) and the Polish Minister of Science and Higher Education Awards (2003, 2008). He also received IEEE IES David Irwin Early Career Award for “Outstanding research and development of modulation and control for industrial electronics converters” in 2011. Kamal Al-Haddad has been a professor with the École de Technologie Supérieure’s Electrical Engineering Department since 1990. He has supervised 90 Ph.D. and M.Sc.A. students working in the field of power electronics for various industrial systems, including modelling, simulation, control, and packaging. He has also coauthored more than 400 transactions and conference papers, transferred 21 technologies to the industry, and is accredited with codeveloping the SimPowerSystem toolbox. Kamal Al-Haddad is currently a fellow member of the Canadian Academy of Engineering, IEEE-IES President Elect 2014–2015, IEEE Transactions on Industrial Informatics Associate Editor, and director of ETS-GREPCI research group.